The ease with which computer's duplicate contents cause that on many occasions your hard drive ends up full of duplicated files, that occupy an important space and cause real chaos when it comes to organizing files. Photos and images are one of the types of files that get cloned on a more regular basis, and if you don't pay special attention and use a tool like PhotoSort, you will find it rather difficult to be able to detect and eliminate these duplicates. By using PhotoSort you will be able to locate identical images and duplicates with ease and in very little time, instead of having to open each image file one by one to be able to check out their contents. This will allow you to free space on the hard drive and maintain your image library organized in very little time. JPEG, GIF, BMP, PNG, TIFF, WMF, EMF, PPM, SRF or CRW are some examples of the large amount of formats supported by PhotoSort. 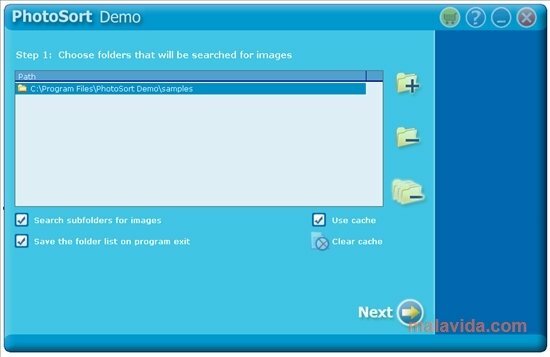 This software is capable of working on a large collection of image files, offering great speed when it comes to detecting duplicates. Once the corresponding folder has been analyzed, and the duplicates have been located you will be able to totally eliminate them from the hard drive, send them to the recycle bin or move them to another folder. If your image library is a total disaster, you can fix it and detect duplicated images by downloading PhotoSort, which will automate this rather slow and boring process. Forget about spending hours searching for duplicate images. The trial version only allows you to detect duplicate images.